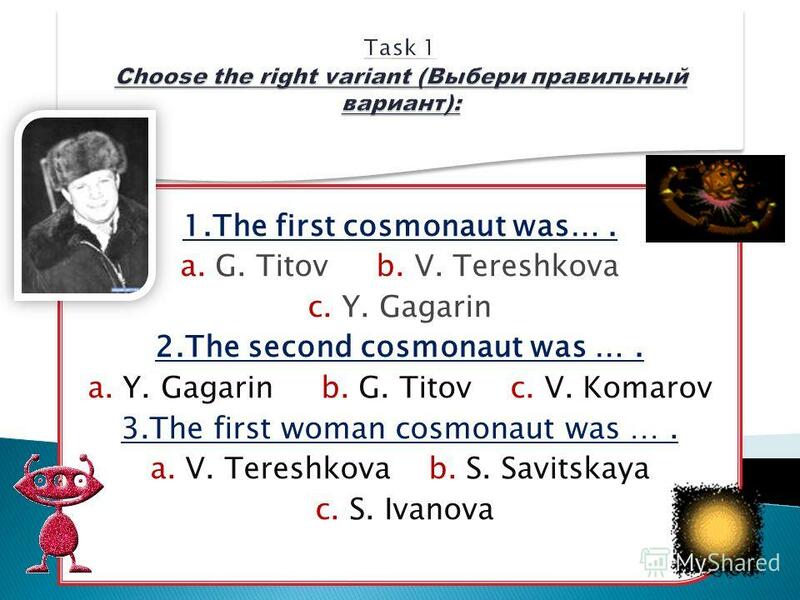 Презентация на тему: "This presentation is devoted to the 50 th anniversary of first mans flight to cosmos Teacher of English PECHCKUROVA H.". Скачать бесплатно и без регистрации. 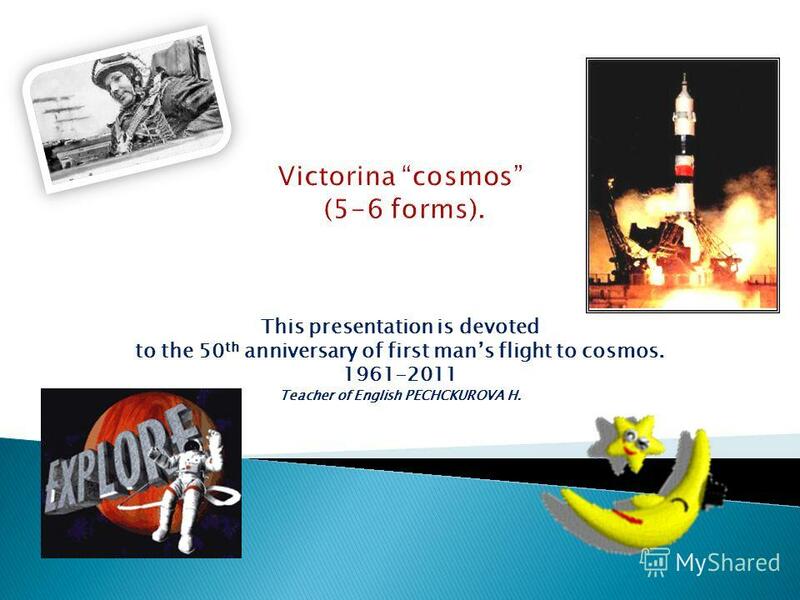 1 This presentation is devoted to the 50 th anniversary of first mans flight to cosmos Teacher of English PECHCKUROVA H.
3 1. The Soviet people were …. to fly into outer space. a). the second b). the ninth c). the first 2. 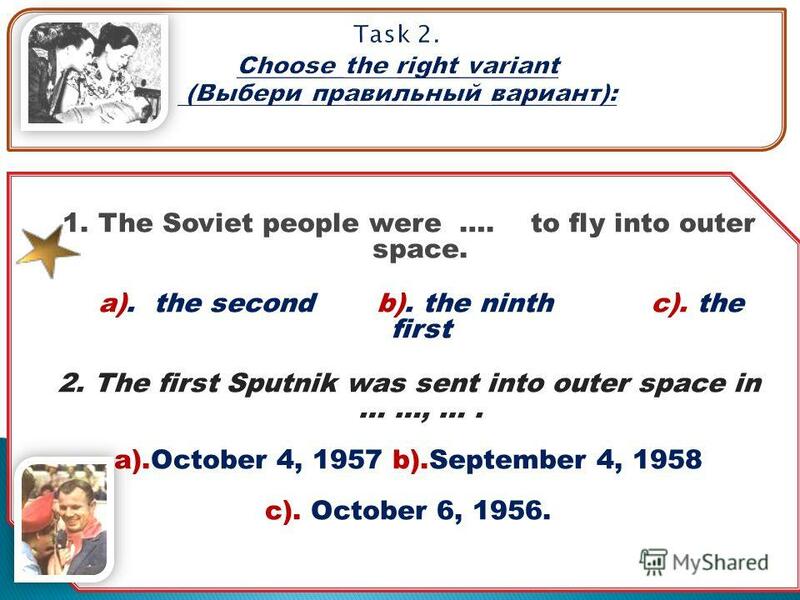 The first Sputnik was sent into outer space in … …, …. a).October 4, 1957 b).September 4, 1958 c). October 6, 1956. 10 Everyone dreamed to shake his hand, to speak with a hero. His smile had become one of the symbols of Soviet Union. He wasnt allowed to go on space flights anymore. 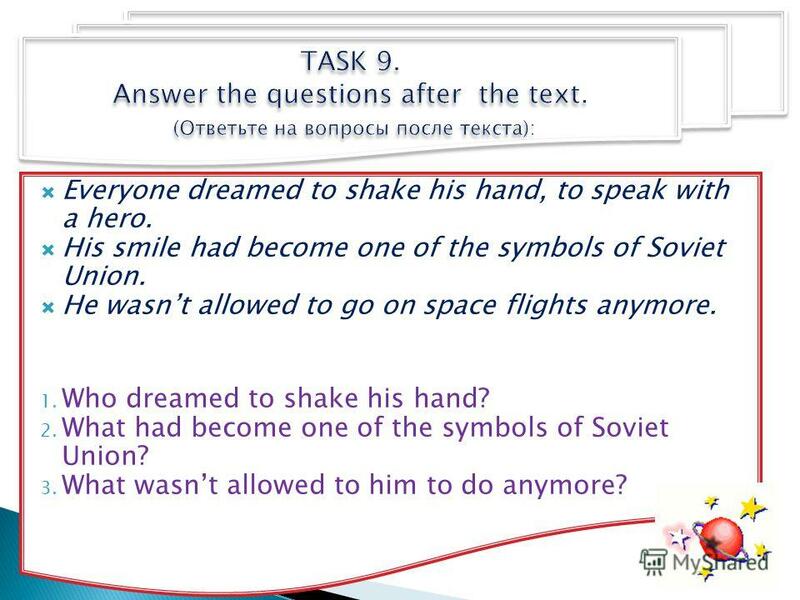 1. Who dreamed to shake his hand? 2. What had become one of the symbols of Soviet Union? 3. What wasnt allowed to him to do anymore? 11 Yuri Gagarin was buried near the Kremlin wall on the Red Square. 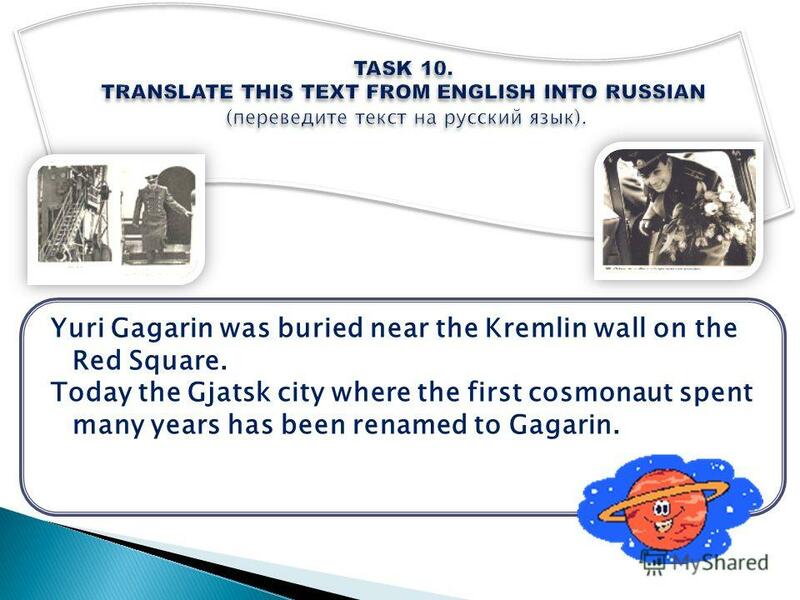 Today the Gjatsk city where the first cosmonaut spent many years has been renamed to Gagarin. 12 Thank you for your attention. See you soon! Учитель: Астапова Ольга Александровна МОУ гимназия им. Подольских курсантов From Yuri Gagarin to Space Tourism. 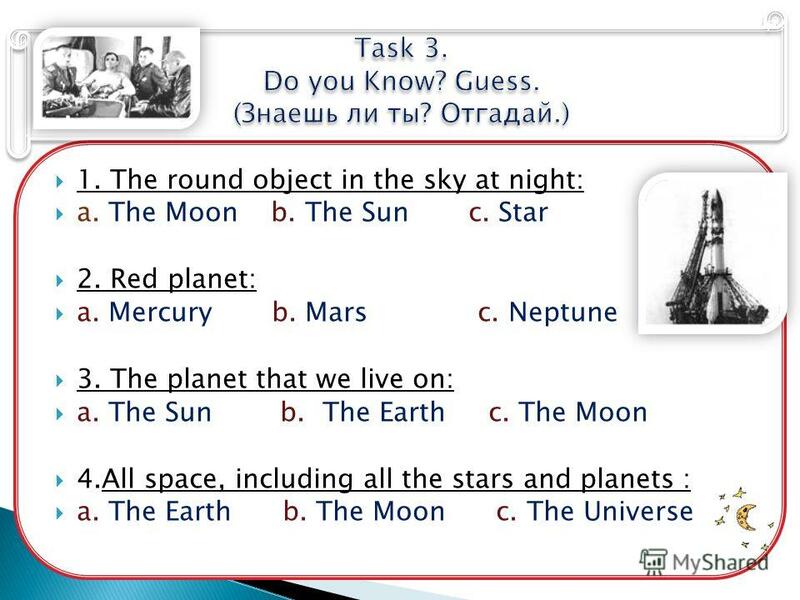 Were a Part of the Universe Работа учеников 8 класса «а» МОУ – СОШ 4 г. Маркса. The Soviet pilot-cosmonaut, Hero of the Soviet Union, cavalier highest distinction a number of states, an honorary citizen of many Russian and foreign. 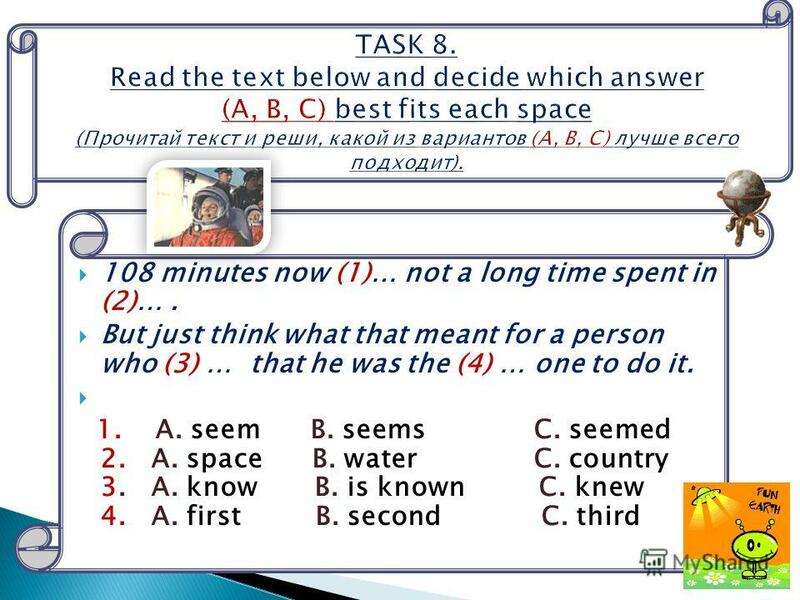 Reading Test Made by Olga Stepanova Tsivilskaya Secondary School 2 Tsivilsk Chuvashia, Russia. Lesson 5 Read the English words. 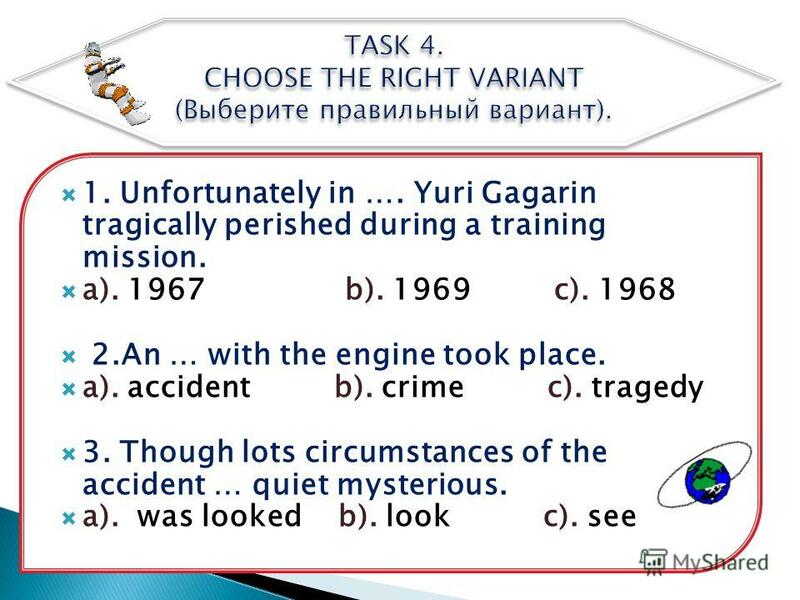 Find the same words in Russian. Прочитай английские слова и найди их русские значения the galaxy планета ocean астронавт. Forty years after Yuri Gagarin became the first man in orbit, an American businessman has become the world's first space tourist. A billionaire businessman. 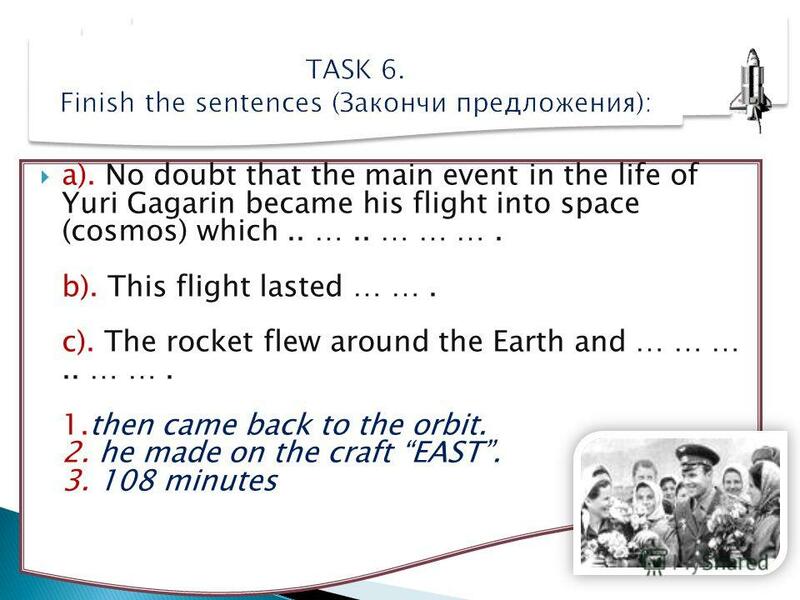 Yuri Gagarin - the hero of the world!. Yuri Alekseevich Gagarin was born on the 9th March in 1934. 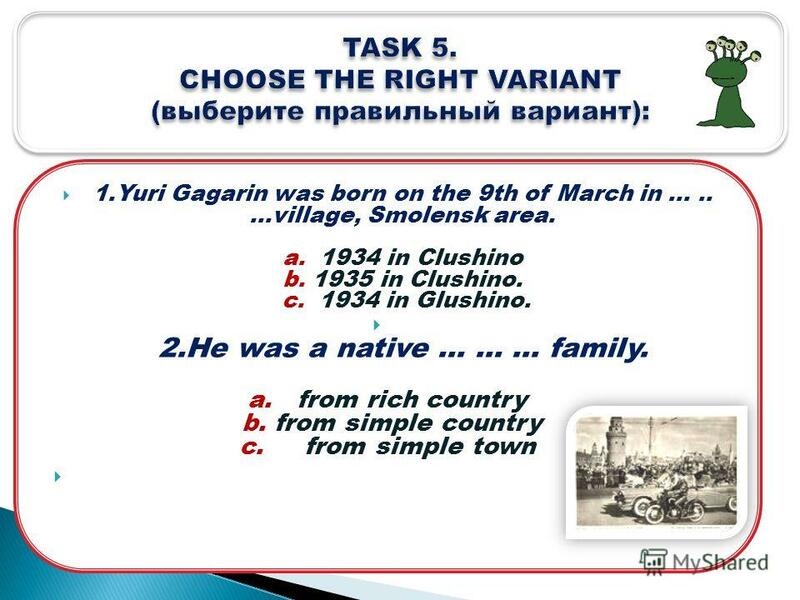 He was an ordinary boy from town Gzatsk. In 1949 Yuri. Were a part of the Universe Were a part of the Universe Работа выполнена учителем английского языка МБОН СОШ с углублённыи изучением математики г.Твери. My role model is Yuri Gagarin. This is the first people who in 1961 went in space. 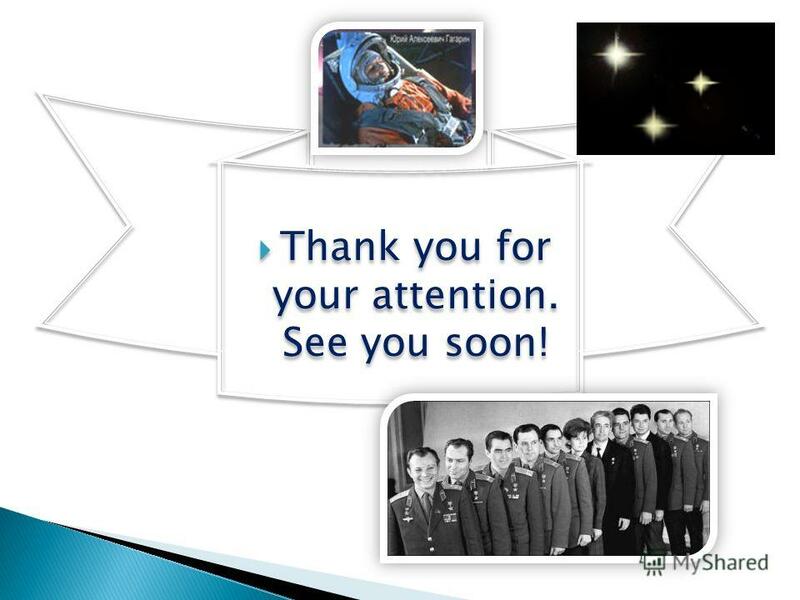 Presentation on "Russia explores the space". The world's first Soviet artificial Earth satellite on 4 October 1957. The Dove Peace Symbol Авторы: учитель английского языка Тугарина Т.П. учитель информатики Александрова З В.. МБОУ СОШ 5 п.Печенга, Мурманская обл., 2011. Were a part of the Universe. S p a c e is a place far above the Earth where there is no air. is a place far above the Earth where there is no air. Exploration space Sokolov Alexander SM1-42. The people always dreamed about space travelling and flying to different stars. In the 20th century this dream. Made by Marina Zimenko. Manned spaceship - a spaceship designed to fly people in space.